Will Obama Blow His Chance With Iran’s New President? War in Syria won’t help US-Iran ties. Here’s a question for the White House: Do you think it’s a good idea to greet the new president of Iran, who might be willing to seek a long-lasting accord with the United States, with a head-on confrontation with Iran and Russia in Syria? 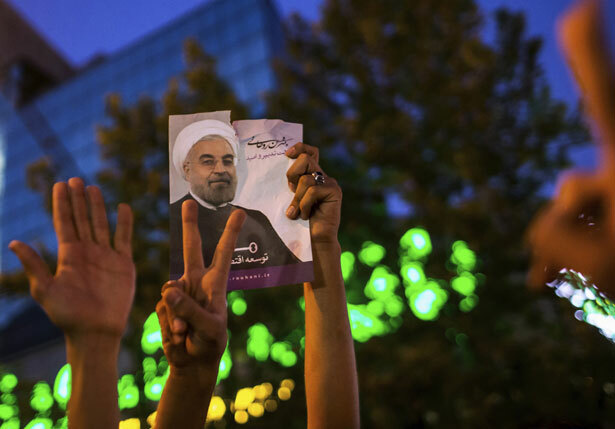 Hassan Rouhani, who’ll take over as president of Iran in August, stunned the world with an outright, 50-percent-plus victory in the June 14 election. By all accounts, he’s a thoughtful, centrist cleric with a moderate outlook. As president, Rouhani will have a lot of power, but he will still have to operate within Iran’s very intricate political system—just as, say, President Obama has to do in dealing with Congress, the courts, his own fractious Democrats, the Pentagon and public opinion. In Rouhani’s case, he has to maneuver around Ayatollah Ali Khamenei, the supreme leader, Iran’s own conservative-dominated parliament, Iran’s judiciary (and the Guardian Council), the entrenched power of the Islamic Revolutionary Guard Corps (IRGC) and other centers of power. Thus, Rouhani will need all the help he can get. Some of that help will have to come from the United States, including positive signals that Washington is ready to deal. But an American-backed war in Syria, aimed at forcible regime change against Iran’s chief regional ally, can only weaken Rouhani and stiffen the opposition of Iranian hardliners, including the IRGC. And, of course, the best way for the United States to aid Rouhani in his internal battles will be do sweeten the offer in the now-stalled nuclear negotiations, finally making it clear that Washington is ready to endorse Iran’s enrichment program under proper international safeguards. In his first post-election news conference on Sunday, Rouhani couldn’t have been more explicit. “This victory is the victory of wisdom, moderation and awareness over fanaticism and bad behavior.” And, in a televised debate just before the election, Rouhani explicitly addressed the nuclear issue. “We have to calculate our national interests. It’s nice for the centrifuges to run but people’s livelihoods have to also run, our factories have to also run.” That doesn’t mean that Rouhani is ready to give away the store on the nuclear issue. He won’t. Not only that, he can’t. But it does mean that—like his chief patron, Ayatollah Ali Akbar Hashemi Rafsanjani, the billionaire businessman who’s been chafing under economic sanctions—he recognizes that Iran’s hard line on enrichment has led to the country’s political and economic isolation from the West. Unlike Saeed Jalili, the current nuclear negotiator and ultra hardliner—who, in his own, failed presidential campaign, called for Iran to live under a “resistance economy”—Rouhani and Rafsanjani realize that the nuclear program isn’t Iran’s number-one priority, especially when a workable deal can be so easily reached. The Obama administration needs to take stock and think hard after this surprise result, especially as its first reaction was full of hasty blunders. It patronised Iranian voters by saying they showed “courage in making their voices heard” and was rude in urging Rouhani to “heed the will of the Iranian people”. If the White House is really “ready to engage the Iranian government directly”, as it said on Saturday, why did it not have the courtesy to send Rouhani a message of congratulations? In any case, nice words won’t help Rouhani get the upper hand at home. If the war in Syria escalates, the United States—by arming the rebels, authorizing a covert operations project by the CIA, building up US forces in Jordan—could push Iran and Russia to meet the United States on the Syrian battlefield. And unless the United States offers Iran an explicit deal to eliminate sanctions in exchange for a nuclear deal, Rouhani may not have the leverage that he’ll need at home. The Obama administration and its European allies—surprised and encouraged by Hassan Rouhani’s election as Iran’s next president—intend to aggressively push to resume negotiations with Tehran on its nuclear program by August to test his new government’s positions, U.S. and European diplomats say. Washington and Brussels are eager to quickly test whether Mr. Rohani’s unexpected victory could pressure Mr. Khamenei into softening his position on the nuclear issue or scaling back Tehran’s broader rift with the West, these officials said. Nothing, you’ll notice, about whether the United States will itself make a more palatable offer to Iran in the hope that its new leader will respond in kind. Rouhani, who was Iran’s negotiator under President Mohammad Khatami—the godfather of the reformist movement who, like Rafsanjani, endorsed Rouhani just says before the election—is a shrewd negotiator himself. In his campaign, defending himself against the hardliners (including Jalili), Rouhani often made the point that when, under his watch, Iran suspended its enrichment program, that allowed Iran to forge ahead by quietly building facilities to advance the program later on. Now, Rouhani skeptics in the West are using those statements against him, trying to portray his as sneaky or duplicitous. But the fact is, no deal was reached in 2003–05, and no deal has been struck since. It’s time for a deal. To take advantage of Rouhani’s victory and break the logjam over nuclear negotiations, Washington has to put on the table incentives it has thus far been unwilling to contemplate. It will have to offer Iran sanctions relief in exchange for agreeing to Western demands. At a minimum, the United States would like Iran to accept IAEA demands for intrusive inspection of its nuclear facilities; cap its uranium enrichment at 5 percent, and ship out of the country its stockpile of uranium enriched to 20 percent. Iran in turn wants a formal recognition of its right to enrich uranium and, more immediately, the lifting of crippling sanctions on its financial institutions and oil exports. Ahmadinejad is faulted in Iran for wrecking the country’s economy. Populism, mismanagement, and international isolation have combined to put Iran’s economy into a downward spiral. Between 2009 and 2013, real GDP growth has fallen from 4 percent to 0.4 percent, unemployment has risen to 17 percent, and inflation has grown to 22 percent—and those are official numbers, which tend to downplay the gravity of the economic crisis. It is estimated that 40 percent of Iranians live below the poverty line. Reformists will grow in strength if they are able to show that they can reverse that trend by at least getting the West for the first time to offer negotiating away specific sanctions. James Harkin chronicles the battle for Aleppo from behind rebel lines.